A Kansas State University student grabbed Hershey's attention earlier this month, when he posted the handwritten note a hungry thief left behind after breaking into his car and stealing nothing but his Kit Kat bar. Now, the candy company has delivered on its promise to make the situation right for the student -- by filling his car with several thousand Kit Kat bars, of course. 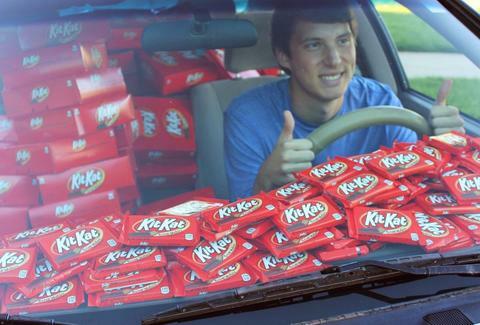 Just days after Hunter Jobbins’ photo of the handwritten apology exploded on Twitter (it's been retweeted more than 184,500 times now), Hershey's stuffed his car with approximately 6,500 Kit Kat bars, according to a report by The Huffington Post. Jobbins promptly invited a huge crowd of his classmates on campus to come by and grab a few for themselves -- you know, instead of breaking into his car again. But Jobbins didn't just give everyone a break, he made it rain Kit Kat bars. Sure, you probably couldn't ask for a better ending to a story involving theft, but hey, maybe Jobbins and the mysterious candy robber will become friends over a nice Kit Kat bar some day. Tony Merevick is Cities News Editor at Thrillist and is thankful for everyone involved that this didn't happen in the chocolate-melting heat of the summer. Send news tips to news@thrillist.com and follow him on Twitter @tonymerevick.